The temperature might be dropping, but thanks to the newest restaurant in Mooloolaba, we’ll all be slinging back summer cocktails and Greek street food all year long. Opening its doors late last week, Spero is the latest venture for renowned Sunshine Coast restaurateur Tony Kelly and his partners, chef Mitch Smith and restaurant manager Elyza Molloy, of Rice Boi fame. Popping up at The Wharf—after three solid weeks refurbishing and reinventing the old Chances premises—this Greek restaurant has ticked all of the boxes to create the kind of family-owned beach style eatery that you might find in Cofu Town. A light and bright fit-out, complete with a stunning tiled bar, cascading greenery and an expansive deck make Spero approachable, and the perfect backdrop to dine on some of the best Greek food on the Sunshine Coast. Which brings us to the menu. 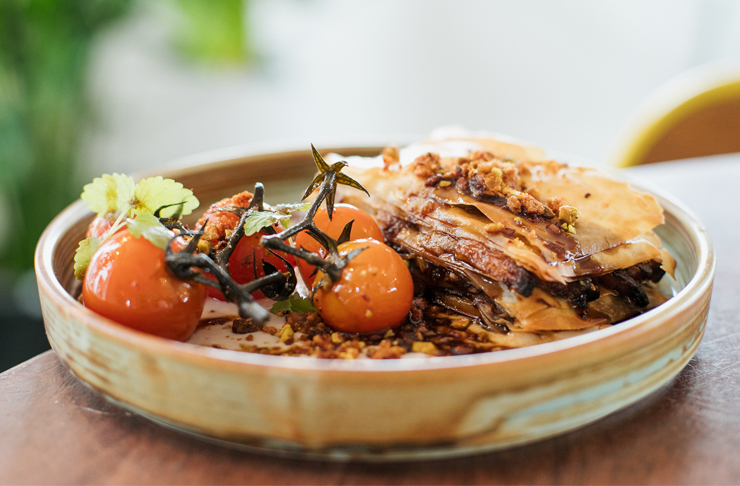 Offering a range of affordable dishes (prices vary from $10-$22) Spero uses quality meats, local seafood and produce to deliver dishes that are as flavoursome as they are pretty. Choosing a favourite is like choosing between children, but that’s what you’re here for. So, start with the Sagnaki Grilled Cheese—a crispy pan-fried sheep cheese with a squeeze of lemon and a sprinkle of wild oregano. It could easily be devoured solo or shared as a small starter. For something a bit heavier, try the Confit Lamb Shoulder, or, if you prefer to graze, the Terracotta Plates, allow you to build your own pita, with either lamb, Greek meatballs or paprika chicken, and a range of sides. In the drinks corner, you’ll find traditional Ouzo and beers including Mythos and Yammas, plus a summer-style lager blended specially for Spero. There’s also a list of delectable cocktails, including a dill and cucumber-infused Greek G&T and a Mediterranean Watermelon Margarita. If you’re pushed for time or looking to eat on the go, a takeaway window is ready to pump out dishes, and we can already imagine skipping across the road for Greek eats on the beach. Open daily from 11.30am until late, Spero is the ultimate addition to the Sunshine Coast dining scene and we’re hardly exaggerating when we say it should skip straight to the top of your hit list.